The newly published Tyndale House edition of the Greek New Testament (THEGNT) is a primarily Alexandrian text, with some cautious deviations from the Nestle-Aland compilation, and with improved spelling. Before describing its text in more detail, let’s look at its physical features. The volume published by Crossway is five and a half inches wide, eight inches tall, and slightly more than one inch thick. 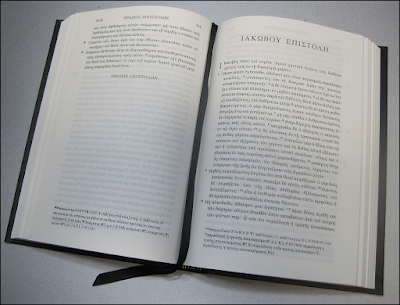 That’s practically identical to the dimensions of the ESV Reader’s Gospels (also published by Crossway). The THEGNT is a Smyth-sewn black hardcover with a single ribbon, and comes in a slip-case. It rests well-balanced in one hand. The brief preface – in which Dirk Jongkind and Peter J. Williams, unlike the authors of the Foreword of the Nestle-Aland-27 edition, did not forget to mention God – is followed immediately by the beginning of Matthew. (A more detailed Introduction is at the end of the book.) The text is printed in a legible Greek font, in one column per page, on pages of no more than 36 lines (usually less, depending on how much space is occupied by the apparatus). As the editors explain in the Introduction, they desired to arrange the text in a format somewhat reminiscent of ancient Greek manuscripts. This is why, instead of indenting paragraphs, the first letter of each paragraph is drawn into the left margin (a feature called ekthesis). Although accents are present, capitalization and punctuation are significantly less than in the NA/UBS texts. The precedent of (most) Greek manuscripts that contain all 27 books of the New Testament, regarding the order of the books, has been mostly followed: Gospels, Acts, General Epistles, Pauline Letters, and Revelation. Hebrews, however, has been placed at the end of the Pauline Epistles. Unlike the format in Papyrus 75 (in which John follows Luke on the same page), each book in the THEGNT begins at the top of the recto of a page (the recto, when a Greek book is opened and lying flat, is the page to the right); consequently there are several blank pages where the preceding book ended on a recto-page. The text is mercifully free of clutter: there are no English headings, no punctuation-related footnotes, no special treatment of Old Testament quotations, and no cross-references. On the other hand, there are no indications of the beginnings of ancient chapter-divisions (kephalaia); in the Gospels the Eusebian Sections are not indicated, and the Euthalian Apparatus is absent in Acts and the Epistles. Yet modern chapter-divisions and verse-divisions are present. Unlike what is observed in ancient manuscripts, the nomina sacra (sacred names such as God, Lord, Jesus, Christ, Son, and Spirit) are not contracted. Brackets have been eschewed, although black diamonds (♦) in the apparatus convey that a textual contest is especially close. The simple format (and good quality paper) contributes to an appealing reading experience for those who wish to read a Greek New Testament that is slightly less Alexandrian than the Nestle-Aland/UBS compilations. 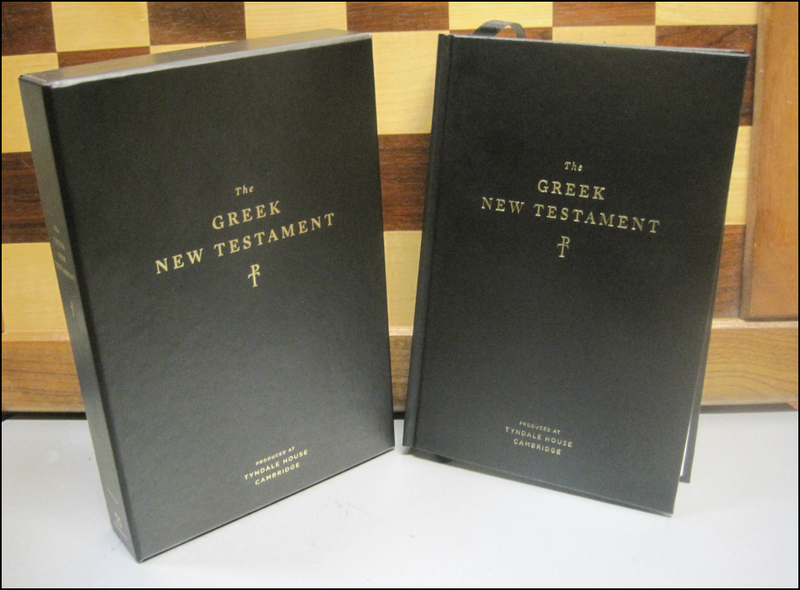 As a study-tool, however, the Tyndale House edition of the Greek New Testament is only minimally useful to those who already have a Nestle-Aland Novum Testamentum Graece, a United Bible Societies/Biblica Greek New Testament, or a New Testament in the Original Greek – Byzantine Textform. Very many significant textual variants have been overlooked, and very many important witnesses receive no attention: no versional evidence is cited and no patristic evidence is cited. It is not infrequent to meet a small and trivial contest in the apparatus near an important and translation-impacting variant-unit that is not covered at all. In First John, eight lines of the apparatus are spent on the Comma Johanneum; meanwhile no notice is taken of the Byzantine non-inclusion of καί ἐσμεν in John 3:1, or of the contest between ποιῶμεν and τηρῶμεν in 5:2. ● Matthew 17:21 is not included in the text, and the apparatus lists only ﬡ* B Θ as the basis for non-inclusion. The witnesses listed for inclusion are “À2 (εκβαλλεται for εκπορευεται) C D K L W Δ 1424.” The earliest witnesses (patristic writings, including Origen’s Commentary on Matthew) are thus ignored. It is as if the editors have embraced the advances that have been made since the days of Tregelles where manuscript discoveries are concerned, but deliberately avoided making use of the progress that has been made in versional and patristic studies – not necessarily when they themselves made text-critical decisions, but certainly when showing readers the basis for those decisions. ● At the end of Mark 9:29, the words καὶ νηστείᾳ (“and fasting”) are included in the text. (The adoption of this reading collides with the UBS editors’ judgment, even accompanied by a black diamond.) The apparatus lists À2 A C D K L W Δ (και τη) Θ Ψ 69 1424 as support for the inclusion of the words, and, for non-inclusion, ﬡ* Β 0274. Where is Papyrus 45vid?! ● Luke 17:36 is not in the text – and there is no footnote about it. ● At Luke 22:43-44, the verses are included in the text (again colliding with the UBS editors’ judgment, and again with a black diamond in the apparatus). The evidence for non-inclusion is listed as P75 À2a A B W 69(and insert after Matthew 26:39). Minuscule 69 (produced in the 1400’s) is listed for non-inclusion in the same apparatus in which 0171 (produced c. 300) is not listed for inclusion?! That seems downright negligent. ● At John 7:52, the entire pericope adulterae is relegated to the apparatus, where the witnesses listed for its inclusion are D K 1424marg. Yet the text of the pericope adulterae in the apparatus does not correspond to the contents of any of those three manuscripts. The confirmatory note in 1424’s margin is not mentioned. An apparatus this incomplete and imprecise is worse than no apparatus at all. ● At Romans 1:16, there is an apparatus-entry mentioning Codex B’s non-inclusion of πρῶτον, but nothing to explain the non-inclusion of τοῦ Χριστοῦ earlier in the verse. ● At Ephesians 3:9, there is an apparatus-entry mentioning the non-inclusion of πάντας by ﬡ* A, but the other variant-units in the verse are not addressed. ● In First Peter 5:7, Papyrus 72, 020, 1241, 1505 1739 et al include οτι, but the word is not in the text, and its absence is not addressed in the apparatus. The text of the Gospels in the THEGNT is generally Alexandrian, but the editors seem to have put Vaticanus on a diet, so to speak, allowing other Alexandrian manuscripts to tip the scales when they disagree with B. The editors also maintained (except in Revelation) a principle that every reading in the text must be supported by at least two early manuscripts. As a result, compared to NA28, the THEGNT has fewer readings with uber-meager support: Mathew 12:47 is in the text; Matthew 13:35 does not receive any attention in the apparatus; Matthew 16:2-3 is in the text (without Ὑποκριταί); in Matthew 27:16-17 Barabbas is simply Barabbas; the interpolation of ﬡ and B in Matthew 27:49 is not even mentioned in the apparatus; Mark 1:41 reads σπλαγχνισθεὶς (not ὀργισθεὶς); Mark 13:33 includes καὶ προσεύχεσθε; Mark 16:9-20 is included in the text (with an annotation found in the core members of family-1 interrupting the text between Mark 16:8 and 16:9); Luke 23:34a is in the text; John 1:18 reads ὁ μονογενὴς υἱὸς (“the only-begotten Son”), John 7:8 reads οὔπω instead of οὐκ, and Luke 24:47 reads καί instead of εἰς (“repentance and forgiveness”). The apparatus in Luke 24 offers a clear view of its inconsistency: an entry is given in verse 19 about a relatively minor variant-unit; meanwhile the short readings of Codex D in verses 3, 6, 12, 17, 36, and 40 are not mentioned. There is no mention of the reading of Sinaiticus in 24:13 either. Turning to the General Epistles (the only part of the Nestle-Aland compilation that has been re-compiled in the past 40 years), it must be observed that the THEGNT fails to consistently cite 1739 and 1505 (both representatives of ancient text-forms) in its apparatus. (1739 is only cited at Hebrews 2:9. Why not at Acts 8:37? Why not throughout Acts and the Epistles?) This is inexplicable, especially considering that 1424 and 69 are abundantly cited. Even where the editors have made an impressive textual decision (as in Jude verse 22, where Tregelles’ text is retained), the miserly selection of witnesses very often prevents readers from obtaining a sense of the reasons for the decision. In addition, it is not rare to encounter readings in the text that are not in NA27, nor in RP2005, which receive no attention in the apparatus. The best thing about this textual apparatus is that it can be easily ignored; the text contains no footnote-numbers or text-critical symbols. v. 22 – ἐλέγχετε instead of ἐλεᾶτε (yielding “Refute” rather than “Have mercy on”). Of these four disagreements, the one in verse 16 is not mentioned in the apparatus. Byzantine readings are not the only ones overlooked in the apparatus; some readings in the Nestle-Aland compilation are also silently rejected. The Introduction at the end of the book includes a list of the witnesses which were used by the compilers. Sixty-nine papyri are listed; a note states that “all available papyri” were consulted but does not specify how many that was. No amulets or talismans are in the list. Sixty-six other manuscripts are also listed (not including 021, 022, 023, 034, 043, et al) as cited witnesses. Nine other manuscripts were used exclusively at Hebrews 2:9 or First John 5:7. In addition, 65 other manuscripts were consulted. Thus one could say that 209 manuscripts were used to make the Tyndale House text, of which 144 are cited at least once. In conclusion: I am glad to see this ten-year project come to fruition. I admire the devout intentions of its creators – not just Jongkind and Williams, but a team of scholars (named in an Acknowledgements section after the Introduction at the back of the book). 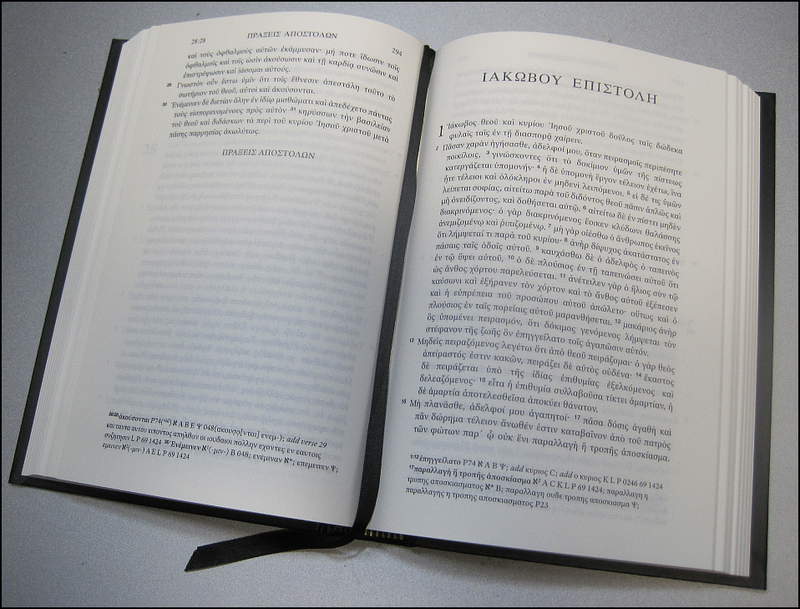 The Tyndale House edition of the Greek New Testament has some features which can only be regarded as advances. Yet it could have been much better if the editors had accepted the sensible advice given long ago (by Scrivener, I think) to the effect that text-compilers ought to seek help wherever it can be found. By insisting on selecting readings exclusively from ancient Greek manuscripts (but strangely overlooking the purple uncials N O Σ Φ), the editors have amplified the voices of manuscripts stored in Egypt (where the low humidity-level allows papyrus to survive longer than elsewhere), while muting the voices of early patristic writers, early versions, and later manuscripts, as if later manuscripts (not only of hundreds of Byzantine copies but also 700, 1582, et al) came full-grown from scriptoriums like soldiers from dragon’s teeth, rather than as echoes of their ancestors. The resultant presentation is simple – but far too simple to be useful for much more than reading. Fortunately, reading the Word of God, even a localized Egyptian form of it, is a blessing. We tend to check images at every point of uncertainty, especially with -vid- readings, where normally we do not accepts readings almost exclusively based on the available space. Keep any suggestions coming - such as 0171 for the inclusion of these verses. We will have an errata list, and I believe this is your second entry. Thanks. 1. "Hebrews, however, has been placed at the end of the Pauline Epistles." Nothing unusual about that--Hebrews is the last of the Pauline Epistles in most modern Bibles (Tyndale, following Luther--who despised James--put Hebrews and James between 3 John and Jude). 2. "The evidence for non-inclusion is listed as P75 À2a A B W 69 . . ." p69 omits the verses too, and there's an interesting story in there somewhere, because, fragmentary as it is, it clearly omits the very same part of the chapter (ωφθη δε αυτω αγγελος through καὶ ἀναστὰς ἀπὸ τῆς προσευχῆς) that the lectionaries move to between Matthew 26:39 and 40--transposing vv. 43 and 44 while they are at it. This is the very codicological feature behind its "absence" in minuscule 69. 3. "The editors also maintained (except in Revelation) a principle that every reading in the text must be supported by at least two early manuscripts." I had predicted that such a policy, if enforced in the Apocalypse, would leave many chunks of text missing entirely--viz., every place where p47 is inextant, and Aleph and Alexandrinus disagree. NA28 rejects countless readings of Aleph even, at ἡμᾶς in 5:9, where it agrees with every other extant manuscript against Alexandrinus. 4. "No amulets or talismans are in the list." Are you sure about that? Tommy Wasserman has identified p78 as an amulet, and--despite its rather wild text--it is typically included in GNT apparatuses. You know those little "miniature bibles" with one verse per page, small enough to fit on a keychain? p78 strikes me as being of that genre. 5. "I'm not sure what's 'Alexandrian' about our text. We didn't especially favour mss from Egypt." --PJW There's no need to, any more than limiting your research to romance movies released in English especially favors Hollywood. Putting the limit far enough back that only Egyptian manuscripts could have survived favours Egypt by default. Favoring Egypt results in an Alexandrian text, by default (although some Western readings could creep in: see 0171). "Much of the work on our apparatus was done by a doctoral student specialising in purple codices." --PJW This doesn't explain why the purple uncials, being first millennium and all, were ignored in the apparatus. That they would be, indicates an Alexandrian bias. A pity it is that the royals, whilst they were at commissioning lavish copies of now-inextant Byzantine Gospels, didn't pry open their wallets even further and commission lavish copies of now-inextant Byzantine Acts and Epistles as well. That act alone could have served to push back the earliest attestation of numerous readings by a couple of centuries. IIRC, the question of χωρὶς vs. χάριτι somewhat hinges on available space in the vid. evidence. And the Comma Johanneum? Seriously? P78 is not included in the list. I was able to check and what do you know, THGNT reverts to the majority reading of ημας at Revelation 5:9. I think we may now finally see the end of following A's singular reading there. Thanks James, a thorough review of the new volume! So the THEGNT isn't really an enhancement of existing critical editions. "The best thing about this textual apparatus is that it can be easily ignored"
The point then for this New Testament is an uncluttered, easy to read casual reader? It's neat, but how does it help get us back to the autographs? Mainly it helps us re: (1) orthography, (2) a more balanced approach to evidence from Egypt, so that one or two witnesses do not overrule much broader and equally ancient evidence, and (3) the THEGNT occassionally has a defensible textual improvement; Jude v. 22-23 for example.